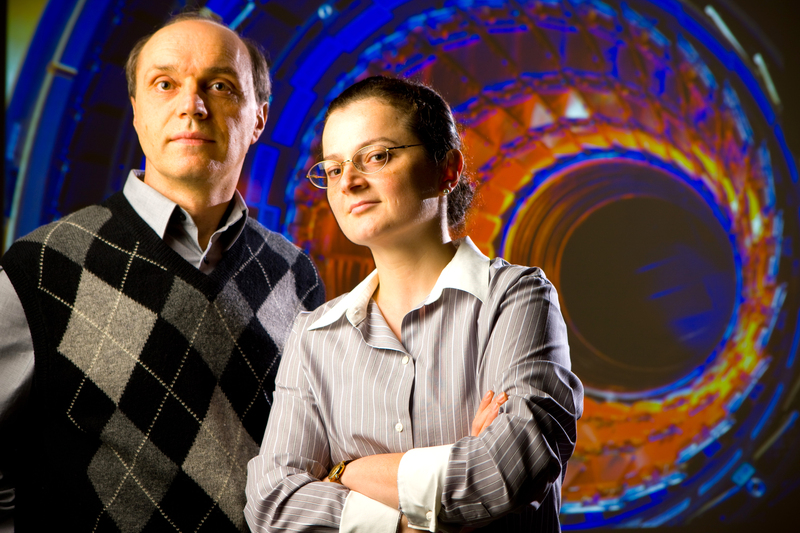 UB physicists Avto Kharchilava, left, and Ia Iashvili contributed to the new research. BUFFALO, N.Y. — Scientists have observed the Higgs boson interacting with the top quark, the heaviest known elementary particle, in an exciting discovery that deepens our understanding of why objects in the universe have mass. University at Buffalo physicists made central contributions to this milestone. The international team of thousands of scientists that announced the results on June 4 included UB physics professors Ia Iashvili, PhD, and Avto Kharchilava, PhD, and UB Assistant Professor of Physics Salvatore Rappoccio, PhD. The Higgs boson, a subatomic particle, helps explain why objects have mass. The particle is linked to the Higgs field, an invisible field that’s thought to exist everywhere in the universe. The way that other subatomic particles, such as quarks and leptons, interact with the Higgs field determines their mass, according to the Standard Model of particle physics that scientists use to describe how the universe works. In experiments at the Large Hadron Collider (LHC), the world’s most powerful particle accelerator, scientists have observed the Higgs boson coupling to the top quark. The strength of the interaction matches the predictions of the Standard Model, verifying this important piece of the model for the first time, though future experiments may reveal new information by providing even more precise measurements. The results were published June 4 in Physical Review Letters by the Compact Muon Solenoid (CMS) Collaboration, an international team of scientists working at the LHC, and corroborated by a second team called the A Toroidal LHC ApparatuS (ATLAS). UB physicists played key roles in developing identification and calibration techniques for detection of quarks through their showers in the CMS detector, an apparatus used to observe subatomic particles produced at the LHC. This work allowed researchers to accurately verify the presence of the Higgs boson and top quarks in experiments associated with the new discovery. “The discovery of the Higgs in 2012 opened the door to a 15-plus year scientific program at the LHC. This discovery is a major milestone in understanding the nature of the Higgs boson. Its properties are still baffling us, and it will take many years to understand the Higgs mechanism,” Rappoccio says. The new findings are consistent with one of the weirdest predictions stemming from the Standard Model. As Rappoccio explains, physicists’ current knowledge about the workings of the universe suggest that the Higgs boson may be “metastable,” which means it could eventually disappear, causing mass and atoms to cease to exist far in the future. “Any large deviations from the top quark’s coupling to the Higgs boson in our predictions would potentially point to a stabilizing factor, but our measurements were consistent with a metastable Higgs boson,” Rappoccio says. There’s nothing to worry about now: This odd fizzling out is predicted to happen in about 10⁵⁸ years or later, Rappoccio says. It’s an unfathomable amount of time, a 1 with 58 zeroes after it, which is many times the number of grains of sand estimated to exist on Earth. Plus, there’s a good chance that the prognosis about the Higgs boson’s instability and the chaos it would cause is wrong, Rappoccio says. Future experiments will measure the Higgs particle’s characteristics more precisely, and could unveil new information that the Standard Model does not yet capture, he says.